The Angriest: Star Trek: The Next Generation: "The Pegasus"
It is 10 January 1994, and time for another episode of Star Trek: The Next Generation. 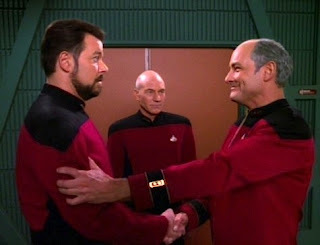 The Enterprise is co-opted for a secret mission by Admiral Erik Pressman (Terry O'Quinn), the former captain of the USS Pegasus - where Riker (Jonathan Frankes) was first posted. When it is revealed that the wreckage of the presumed-destroyed Pegasus may have been found, and that its destruction coincided with an unprecedented mutiny against Pressman, Captain Picard (Patrick Stewart) finds himself pitted against his own first officer to uncover the truth. "The Pegasus" is a great little episode that takes the pristine, whiter-than-white image of Starfleet in The Next Generation, and then kicks a pretty firm dent in it. That's an enormous step for the series, and will be followed by several more in sister series Deep Space Nine. Watched now - particularly in the wake of CBS' new series Star Trek: Discovery - and it may seem a little tame. In 1994 it was pretty shocking stuff for the Star Trek universe. The revelations here are solid gold for dramatic purposes: fresh out of Starfleet Academy, Ensign William Riker found himself on the bridge of the USS Pegasus. It was conducting an illegal experiment to develop a Federation cloaking device, in defiance of treaty with the Romulans. The cloaking device performed even better than expected, not only rendering the ship invisible but phasing it through matter. Despite an accident killing several crew members, Captain Pressman insisted on continuing with the experiments - at which point his first officer led an armed mutiny to relieve him of command. Pressman escaped, Riker along with him, and the Pegasus was presumed destroyed as a result of the ongoing accident. That's all back story, but it filters out over the course of the episode as Pressman returns to claim the damaged ruins of the Pegasus before the Romulans can discover it. This puts Riker in an impossible place: loyal to Picard, but bound by Starfleet orders to obey now-Admiral Pressman. There's a cover-up, there are fierce arguments, there are threats, and there's even a Romulan warbird tracking the Enterprise through a passive asteroid field. Jonathan Frakes does a great job front-and-centre as the conflicted Riker. Patrick Stewart delivers a typically strong performance. Guest star Terry O'Quinn is particularly good, making an immediate impression with viewers and absolutely selling the concept of a hard-edged, whatever-it-takes bully of an officer. O'Quinn has always been a strong actor, and he brings his A-game here. This episode boasts an excellent script by Ronald D. Moore - and the greying of Starfleet's morality is absolutely in Moore's wheelhouse - and solid direction by LeVar Burton. All that, and the priceless cold open of "Captain Picard Day" too. We're 12 episodes into Season 7, and this marks the sixth good one. The quality ratio rises, but it's still only 50 per cent.